Yesterday’s blog discussed the way we handle life changing events…those events that shatter everything in our life, and cause us to basically start our lives over, usually in a sometimes different direction. However, my blogs do not always go in the direction I start them out in. And although I liked the way it worked out, this one was a prime example. It was actually based on an incident which happened well over ten years ago; one I hadn’t thought about for a while. But as a writer, certain ideas hit me at certain times, and usually the final finished product is a bit different than I thought it would be. But it’s important to describe the incident which inspired Part 1 of this blog, because it’s still the basis for what was written. So here we go. Several years ago as our daughter was cleaning the house for us, I got a call from her. I could hear in her voice she was upset to say the least. Yes I knew it. It was my grandmother’s. And probably over a hundred years old. “Well…..it fell off the shelf when I was dusting. And…it broke. I’m sorry.” And I knew she was. I could hear it in her voice. Not trying to convey how really upset I was over the phone, I told her to sweep up all the pieces and put them in a plastic bag. Every one she could find. Use the dust pan and get all that you can. I cringed. “I don’t care. Just get as many as you can and put them in a bag and l look at it when I get home. It’s ok. It was an accident.” Did I feel that calm??? Absolutely not!!! But I couldn’t tell her. I was very upset. Yes, it was only a thing, but it had been my grandmother’s, and it had been one of her favorites. When I got home my worst fears were realized. There were a few larger pieces, but oh, so very many little ones. I really didn’t think anything could be done, but I had to try. So I called several places trying to find someone who could possibly put the vase back together. And after several tries, the Chrysler Museum here in Norfolk told me about a porcelain restoration specialist who they highly recommended, but couldn’t guarantee he’d take on the job. I must say I was a bit scared to call the man, but was expectant when he agreed to have us bring over the pieces so he could take a look. I had no idea what to expect. I sadly shook my head. “No, I don’t. I wish I did…” I just knew it was hopeless at that point. I left the pieces with him, still not totally convinced the vase would ever look anywhere close to what it had been. But yet, he was a master restorer, and highly recommended, and somehow, I knew it would be all right. I was. I couldn’t tell where it had been broken. In fact, it looked better than I remembered it looking. No trace of lines putting together the broken pieces, nor could I tell where he’d had to improvise and insert other pieces to fill in the gaps. It looked even better than before. I was totally amazed. And yes, our daughter was very relieved. And his work was certainly worth what he charged. At the time, to me, it was priceless. Today that vase sits in a glass cabinet where it cannot be damaged again. Where it’s safe. And a reminder that we never know what miracles can take place when a master is at work…when we put it in the Master’s hands. Like that shattered vase, when our lives are shattered, and our dreams crushed beyond what we think can ever be repaired, the Master Restorer is waiting to fix what is wrong. But unlike my porcelain restorer, the Master Restorer doesn’t charge us for His work. It’s totally free. All we have to do is ask. And be willing to follow His instructions, His leadership. To trust Him. When we put our faith in our Master Restorer, He will come through, and He will put the pieces back together again. 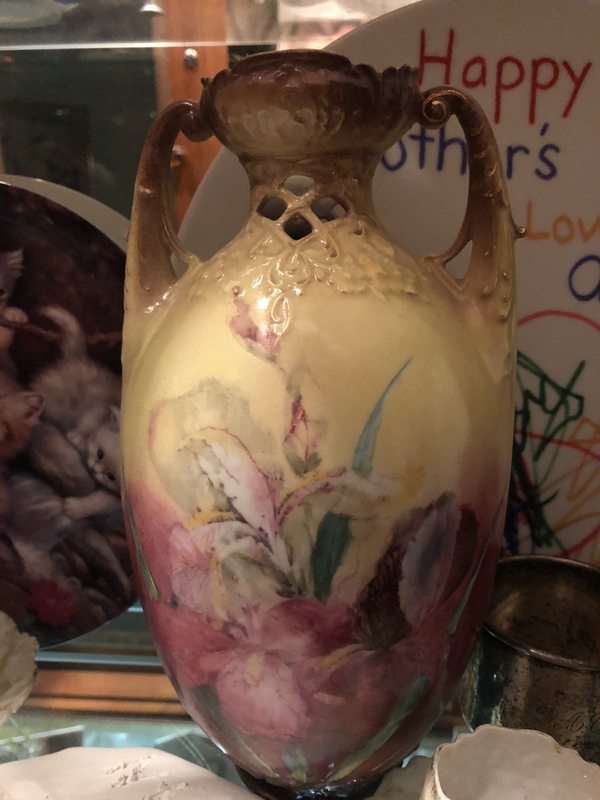 And the finished product, like my grandmother’s vase, will be even better, even more beautiful, than it was before it was shattered.If your life has been shattered, your dreams crushed, do not give up hope. Because restoration is ready and waiting. It will take a while, and it will at times require a lot of faith, and a lot of courage, but in the end, the final result is worth it. Like my vase that I never expected to be whole again, your shattered life and shattered dreams can be restored. What are you waiting for? What do you need to be restored? Don’t waste any more time. Your restoration is waiting for you! All you need to do is ask. And receive. And that’s the story behind yesterday’s blog.